Eider farming is a rare example of a mutually beneficial relationship between humans and a wild bird. Eiders (Somateria mollissima), large northern ducks, spend most of their life in the sea, except for one month every year when they build a nest and hatch ducklings. The female lines the nest with down that she plucks from her breast and belly. This down is the best natural insulator for the nest. 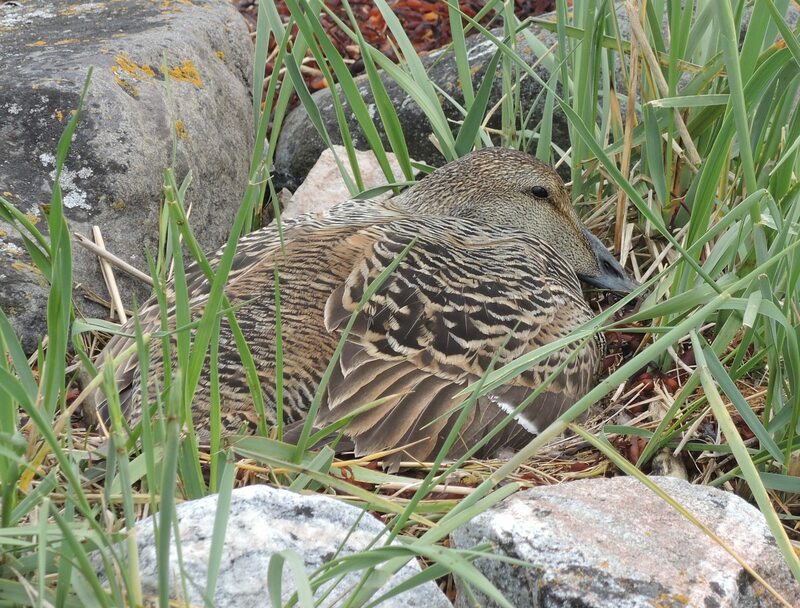 The female eider on her nest with eggs and down. 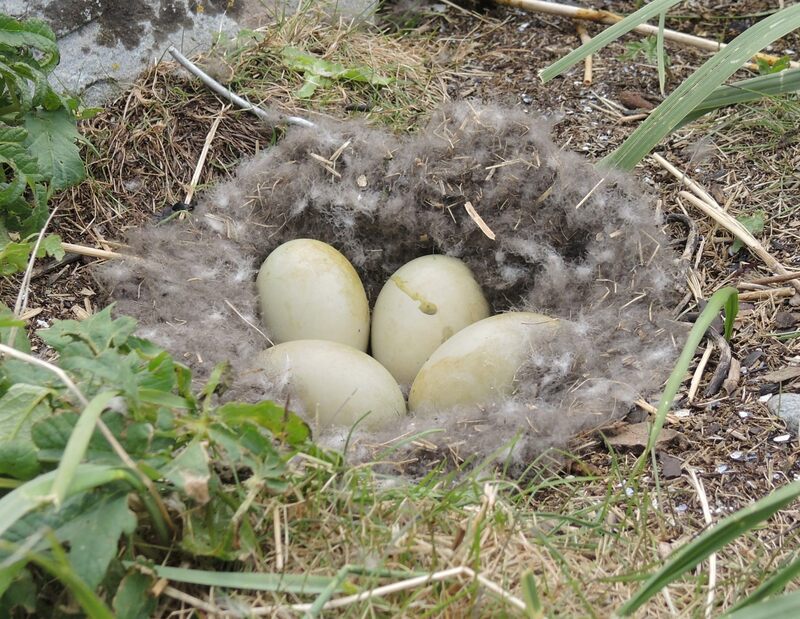 An eider nest with eggs and down. Several centuries ago Norwegians and Icelanders started protecting eider nesting grounds and collecting down. Among developed nations, only Iceland has preserved eider farming culture. About 350 families collect about three metric tons of eider down annually, which generates approximately five million US dollars. The English-language literature says little about the history and technology of eider farming, while the story of eider farming in the USSR in the first half of the twentieth century remains totally unknown. 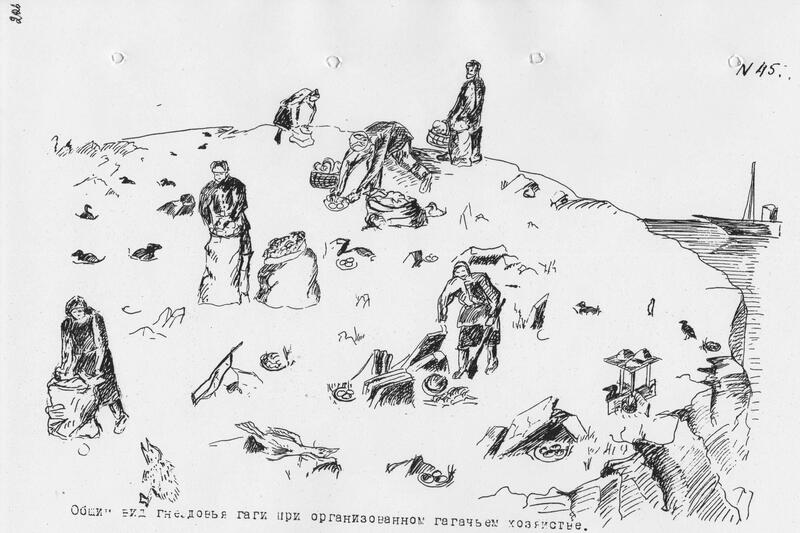 The first effort in Soviet eider farming culture was made in the Solovki special purpose camp (a large forced labor camp for political prisoners on islands in the White Sea). 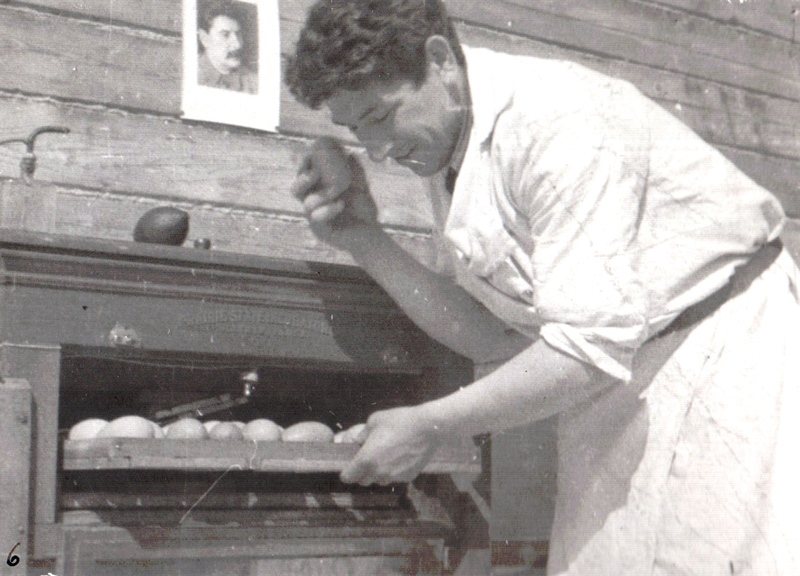 In 1925, one of the inmates, a zoology teacher by the name of Mitrofan Nekrasov, convinced the authorities to set up an eider reserve, and started experimenting with artificial incubation of eggs. He planned to increase the size of the eider population and to train birds not to be afraid of humans. Despite basic conditions (the boxes with eggs were kept on top of a woodstove) the experiment was a success, with 157 out of 189 eggs hatching. Mitrofan Nekrasov published several articles about his work. Soon, however, the rules of the Solovki camp became more restrictive and Nekrasov had to stop his work. In the 1930s, two nature reserves were established in the Murmansk Region: the Kandalaksha reserve (1932) and “Seven Islands” (1938). Until the end of the 1950s, both reserves engaged in work that was common on eider farms but absolutely incompatible with one of the core principle of nature reserves, namely that there should be no human involvement in natural processes. Moreover, in those years, the development of methods of eider farming was one of the main aims: artificial shelters were built, predators shot, and experiments carried out in incubating and raising the ducklings. Artificial incubation of eider eggs in the Seven Islands Nature Reserve in 1939. Photo: Kandalaksha Reserve, Scientific Archive. Weighing of eider down collected in the Kandalaksha Reserve. Beginning of the 1950s. Between 1940 and 1945, such work was successfully carried out on the Novaya Zemlya archipelago. Biologist Nina Demme of the Arctic Scientific Research Institute studied several dozen islands, set up artificial shelters for the eiders, organized the extermination of predators, and taught local traders correct methods of collecting down. In five years, 5,354 kilograms of eider down had been collected under her management. In 1946, Nina Demme defended her PhD thesis on nesting colonies of common eider in Novaya Zemlya and organizing eider farms. A drawing from N. Demme’s thesis. Nesting ground in an eider farm. Between 1930 and 1960 several dozen scientific and popular articles were published in the USSR, with detailed research-based instructions on setting up eider farms as well as the arguments in support of their profitability. The emphasis was on the need to “attach” eider nesting grounds to specific collective farms, which would use them as one of income sources. So why, if the eider population was considerable and the technology developed and instructions generally available, was there was not a single attempt in the USSR to set up an eider farm? I think there were two main reasons. First, the eider was protected only within nature reserves, while hunting, collection of eggs, and destruction of nests continued in other, often very close by, places, as many sources document. Under such conditions the eider does not lose its fear of humans, as would be required for eider farming. Second, successful eider farming is possible only if one works at the same location for decades. That’s the case in Iceland and Norway, where eider farms are located on private land, usually held for generations. In the USSR, experimental eider farms could have only existed within protected state nature reserves. They could not be located outside the reserve because there was no privately owned land. 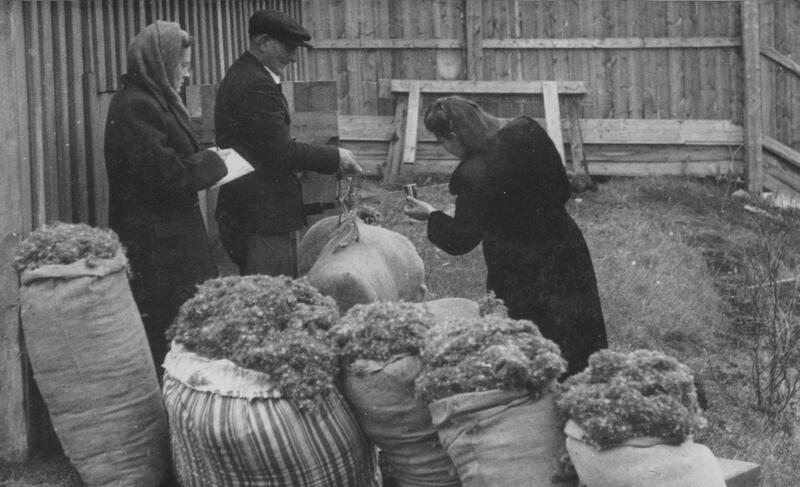 Social cataclysms and a lack of legal protection for private rights in the USSR led to the situation when no one could be sure of tomorrow, and the probability that children would continue their parents’ business was close to zero. Thus eider farming, normally based on long-time traditions and protected by private property rights, did not have a chance in the USSR. Goryashko, Alexandra. “Attempts to Establish Eider Farms in the USSR, and Why These Failed.” Environment & Society Portal, Arcadia (Summer 2017), no. 14. Rachel Carson Center for Environment and Society. https://doi.org/10.5282/rcc/7897. Deme-Ryabtseva, N. P. Gnezdovye kolonii gagi obyknovennoi Somateria mollissima mollissima (L.) na Novoi Zemle i organizatsiia gagach’ego khoziaistva [Nesting colonies of the Common Eider Somateria mollissima mollissima (L.) in Novaya Zemlya, and establishing an Eider farm]. Unpublished PhD dissertation. Leningrad: Zoological Institute, 1946. Formozov, A. N. Gaga i promysel gagach’ego pukha. [The Eider and the Eider down trade]. Moscow: Vseokhotsoyuz, 1930. Gerasimova, T. D. Ekologiia gagi Murmanskogo poberezh’ia i metody ratsionalizatsii gagach’ego khoziaistva [The ecology of the Murmansk coast Eider and methods of rationalizing Eider farming]. Unpublished PhD dissertation. Kandalaksha Nature Reserve, 1951. Nekrasov, M. “Opyt odomashneniia gagi v Solovetskom biosade” [An experiment in domesticating the Eider in the Solovki Biological Garden]. Zhivaia priroda 1925, no. 23: 308–10. Uspensky, V. S. Gaga i gagach’e khoziaistvo [The Eider and Eider farming]. Moscow: The Headquarters for Nature Reserves, Zoos, and Zoological Gardens, 1946. “Kandalaksha Nature Reserve: Protecting Russia’s Northern Maritime Wonders”. Russian Conservation News, 2000, 23 (Summer): 4–7. The Common Eider, its Holy Patron, and the Transformation of Information, Priroda, 2015, 10: 57–67. Alexandra Goryashko is a science writer from Russia. She studied animal psychology at the Moscow State University. Since 1980 she works with the Kandalaksha Nature Reserve, helping in science research and in popularizing its work. A member of the Sea Heritage Association, the Kola Ecological Center, and the Union of Litterateurs of Russia. An author of over 160 publications on the history of science, ecology, and nature protection. A winner of several Russian competitions among writers in the field of nature protection. Received grants from the Soros Foundation (1998) and Macarthur Foundation (2004). Obtained state stipend for literature and art (2001, 2002, and 2003). Alexandra Goryashko is presently working on a book Wild Bird and Cultured Man. The Common Eider and Homo Sapiens: Fourteen Centuries of Interaction. The present article reflects, in a condensed manner, the content of one of the book’s chapters.